Packer Throme longs to bring prosperity back to his decaying fishing village by discovering the trade secrets of a notorious pirate who hunts the legendary Firefish and sells the rare meat. Fantasy by George Bryan Polivka. 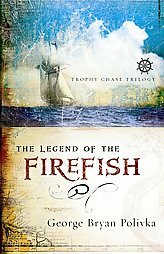 The Legend of the Firefish is a timeless tale of the pursuit of faith and honor. Packer Throme longs to bring prosperity back to his decaying fishing village by discovering the trade secrets of a notorious pirate who hunts the legendary Firefish and sells the rare meat. Armed with the love of the priest’s daughter and a noble purpose, Packer stows away on the ship Trophy Chase bound for sea. But many tests of his faith and his resolve follow. Will belief and vision be enough for the young man to survive? Captivating action, dialogue, and insights into the heroic struggle of faith make this an ideal read for fans of adventure, fantasy, and well–told tales of honor. What a great trilogy! Except for the actual Firefish I wouldn’t call the books “fantasy” since the rest is based in the real world. If you like high sea adventures this is the trilogy for you. Extremely well written too. Thanks for that amendment, Steve. Would you say the word “historical” should replace “fantasy,” then?